Despite all the effort WWJ has put into finding and covering software developers that have successfully transitioned out of Japan’s navel-gazing mobile market to markets elsewhere, I must admit we haven’t found thousands. Or even dozens. But one of them is Shinjuku, Tokyo-based G-mode, and this week the Japanese mobile game maker and its Dublin, Ireland-based partner Upstart Games said four IQ-enhancing games, already popular in Japan, would be distributed in the US and Europe via Upstart. The news underscores the profits to be found when forward-thinking mobile players work hard to bridge the wireless culture divide. Upstart’s CEO Barry O’Neil told WWJ that the company has been planning to launch a brain training game for mobile since the runaway success of the genre in Japan late last year. Ironically, the Irish side was initially skeptical that such a narrow niche could win operator interest in Europe or the US. “We’ve a relationship with G-mode dating back to last year, and their Right Brain Paradise was something we’d looked at in the past, but felt gaining operator support could be difficult. Now that the genre is becoming more widely known we felt the time was right to introduce this mobile series,” he wrote in an email yesterday. The three-game series, dubbed, “I.Q. Academy” is intended to help get players’ brains in shape by offering games designed to exercise the brain’s right side and improve spatial, visual and cognitive skills in the player. I.Q. Academy is based on G-mode’s hyperpopular ‘Right Brain Paradise’ series, which, according to the company, has sold almost two million downloads. The series is expected to launch in Europe and the US in the coming months (WWJ subscribers log in for full article). G-mode’s Right Brain Paradise-series first launched in Japan in March 2003, with new releases having being made to the series since then. The games include specially designed puzzles to gauge a player’s responsiveness and accuracy in performing tasks such as recognizing shapes and patterns, predicting a series of actions and other tasks aimed at improving spatial resolution. Whether that’s true or not, it certainly has a positive effect on game software developers’ bottom lines. 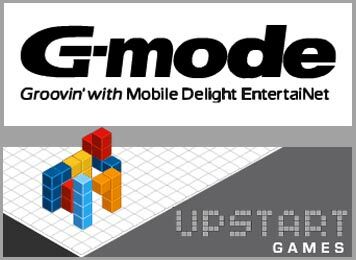 G-mode has evolved since foundation in 2001 (just before NTT DoCoMo launched Java services on i-mode) from a small start-up focusing initially on the Japan market to become a growing force in mobile gaming, with business partnerships and capital tie-ups involving a range of Europe- and US-based carriers, application developers and game publishers. Upstart Games has similarly seen solid growth since foundation in 2002, and now works with carriers in the US and Europe as well as with major Japanese game publishers including Konami and Sony Computer Entertainment. The wireless tech advances in Japan render at least some popular titles undeliverable in the US and Europe. Game publishers outside Japan could well partner with a Japanese developer having a library of high-quality 3D titles, for example, but these games aren’t easily localized to run on networks and devices elsewhere. “Device support issues in the West are an issue. The technical challenges of porting these to the magic 80 percent of a western carrier’s device list makes it commercially unfeasible, if not technically impossible,” says O’Neil. Of course, there is scope for limited releases on high-end UMTS/3G and other devices, but such limited distribution can make tuning a profit a real challenge. Finally, there are culture issues. O’Neil thinks only about 10 percent of all Japan-originated titles will have any chance of success outside of i-mode’s birthplace. The trick for Upstart, G-mode and other publishers is to identify the right 10 percent.